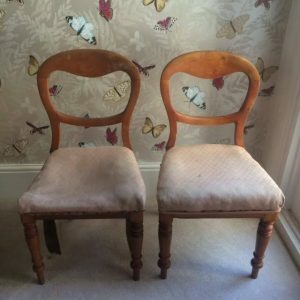 A pair of vintage solid wood spoon back dining chairs, upholstered to the seat in cream patterned fabric. 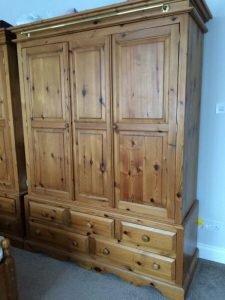 A tall standing solid pine triple wardrobe, having three drawers above five drawers. 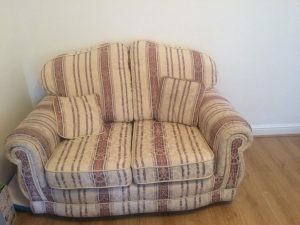 A two seater high back vintage sofa on solid wood feet, upholstered in striped patterned fabric. 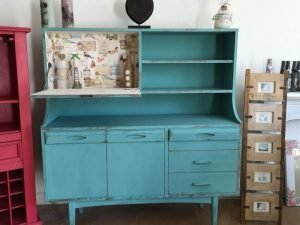 A hand painted blue solid wood kitchen sideboard, having a pull down shelf aside two shelves, above two cupboards and three drawers. 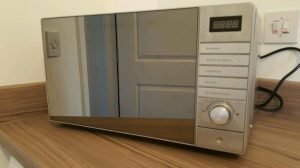 A silver stainless steel mirror fronted large capacity microwave. 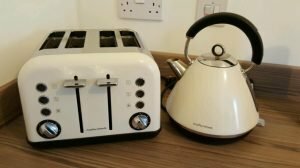 A cream and stainless steel Morphy Richards four slice toaster and matching kettle. 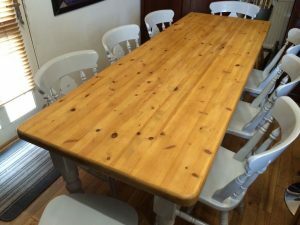 A hand painted white solid pine rectangular dining table, together with eight matching curved back dining chairs. 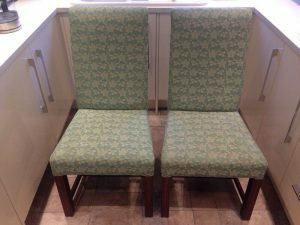 A pair of vintage high back dining chairs on solid mahogany legs, upholstered in cream and green floral printed fabric. 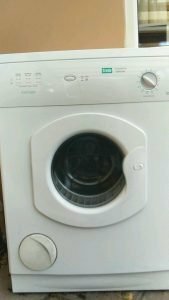 A white Creda Simplicity under counter large capacity tumble dryer. 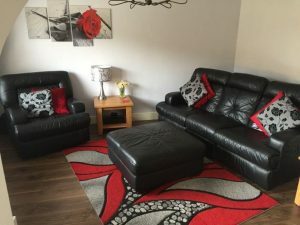 A three piece sofa suite, to include a three sewer high back sofa, an armchair and a square storage footstool, together with a large red and grey woollen area rug. 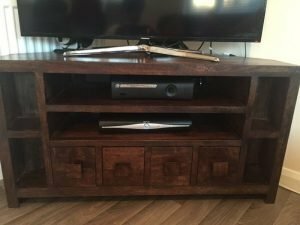 A vintage solid wood television stand, having two shelves to either side of a central shelf and four drawers, together with a black and silver Samsung flat screen 50 inch television. 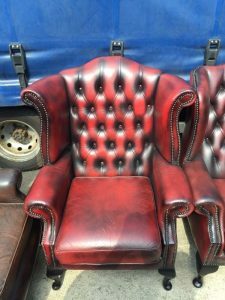 A par of vintage wing back Chesterfield armchairs on solid mahogany legs, upholstered in ox blood red leather with button detail to the back. 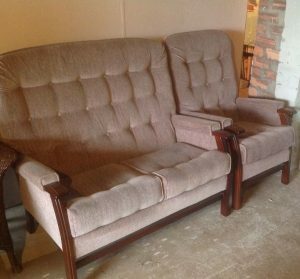 A two seater high back vintage sofa and matching armchair on a solid wood frame, upholstered in cream fabric with button detail to the back. 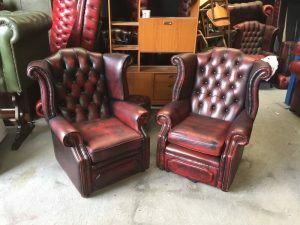 A pair of vintage wingback Chesterfield armchairs on ball feet, upholstered in ox blood red authentic leather, with button detail to the back. 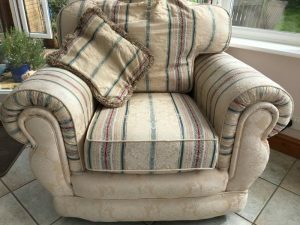 A large high back vintage armchair on solid wood feet, upholstered in cream floral and striped patterned fabric. 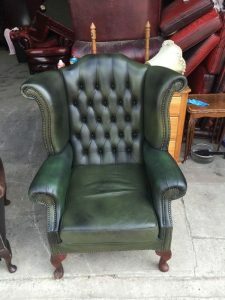 A vintage wing back Chesterfield armchair on solid mahogany legs, upholstered in green authentic leather. 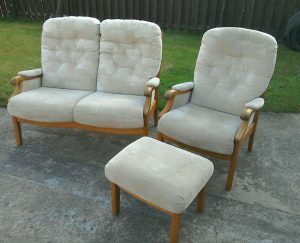 A three piece vintage sofa suite, to include a two seater high back sofa, an armchair and a footstool. 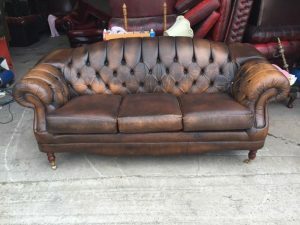 A vintage three seater Chesterfield sofa on solid mahogany legs and brass castors, upholstered in authentic brown leather. 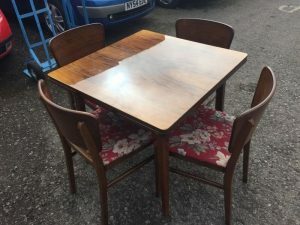 A vintage solid wood square dining table, together with four matching curved back dining chairs, upholstered to the seats in floral patterned red fabric. 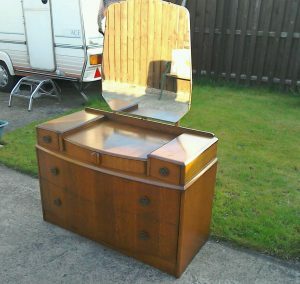 A vintage solid oak vanity dresser and large detachable bevelled mirror, having three small over two large drawers.